The 65th Infantry Regiment, nicknamed "The Borinqueneers"  from the original Taíno name of the island (Borinquen), is a Puerto Rican regiment of the United States Army. The regiment's motto is Honor et Fidelitas, Latin for Honor and Fidelity. The Army Appropriation Bill created by an act of Congress on 2 March 1898, authorized the creation of the first body of native troops in Puerto Rico. On 30 June 1901, the "Porto Rico Provisional Regiment of Infantry" was organized. On 1 July 1908, Congress incorporated the regiment into the Regular Army as the Puerto Rico Regiment of Infantry, United States Army. On 14 May 1917, the Regiment was activated and additional men were assigned, with the unit being sent to serve at Panama. On 4 June 1920, the Regiment was renamed 65th Infantry. During World War II, the Regiment saw action throughout Europe, especially France and Germany, participating in Naples-Foggia, Rome-Arno and Rhin. Several Purple Hearts were handed posthumously to members of the 65th Regiment. Puerto Ricans have participated in many of the military conflicts in which the United States has been involved. For example, they participated in the American Revolution, when volunteers from Puerto Rico, Cuba, and Mexico fought the British in 1779 under the command of General Bernardo de Gálvez (1746–1786),  and have continued to participate up to the present-day conflicts in Iraq and Afghanistan. Puerto Rico became a U.S. Territory after the 1898 Treaty of Paris which ended the Spanish–American War. The United States appointed a military governor and soon the United States Army established itself in San Juan. In 1942 the 65th Infantry underwent an extensive training program and in 1943, it was sent to Panama to protect the Pacific and the Atlantic sides of the isthmus. On 25 November 1943, Colonel Antulio Segarra, succeeded Col. John R. Menclenhall as commander of the 65th Infantry, thus becoming the first Puerto Rican Regular Army officer to command a Regular Army regiment. In January 1944, the regiment was embarked for Jackson Barracks in New Orleans and later sent to Fort Eustis in Newport News, Virginia in preparation for overseas deployment to North Africa. In November 1944, Company C provided security to the headquarters of the Seventh United States Army. The rest of the First Battalion was assigned other tasks, such as defending the Command Center of the Sixth United States Army Group. The Second and Third Battalions were assigned to defend communications. In 1948, seven members received the Bronze Star for their service in World War II. On 13 December 1944, the 65th Infantry, under the command of Lieutenant Colonel Cordero Dávila, relieved the 2nd Battalion of the 442nd Infantry Regiment, a regiment which was made up of Japanese Americans under the command of Col. Virgil R. Miller, a native of San Germán, Puerto Rico and former member of the 65th Infantry Regiment. The enemy made many attempts to encircle the regiment, but each time they failed because of the many casualties inflicted by the 65th. 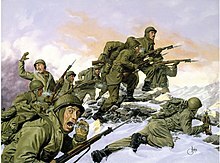 Because the 65th held their positions, that enabled the U.S. Marines to withdraw from the Chosin Reservoir in December 1950. When the Marines were surrounded by the Chinese Communist troops close to the Manchurian border, they were ordered to retreat and work their way back to Hungnam. The men of the 65th rushed to their defense and were ordered to stay behind and fight the enemy. As a result, the Marines were able to withdraw to their ships with the 65th holding the rearguard. The 65th, attached to the 1st Marine Division, was awarded the Navy Unit Commendation for their defense  and were among the last units to embark from Hungnam. Among the battles and operations in which the 65th participated was Operation Killer in January 1951, becoming the first regiment to cross the Han River in South Korea during the operation. In April 1951, the regiment participated in the Uijonbu Corridor drives and in June 1951, the 65th was the third regiment to cross the Han Ton River. The 65th took and held Chorwon and they were also instrumental in breaking the Iron Triangle of Hill 717 in July 1951. In November 1951, the regiment fought off an attack by two regimental size enemy units. Colonel Juan César Cordero Dávila of the 296th Regiment requested a transfer to active service in Korea. In December 1951, Chief of Staff J. Lawton Collins visited Puerto Rico and granted the request, reassigning him to the 65th, replacing him with Lt. Col. Sepúlveda. Col. Cordero was formally named commander of the 65th Infantry on 8 February 1952, thus becoming one of the highest ranking ethnic officers in the Army. Brigadier William Warner Harris ( USMA 1930) published a book that captured the distinguished history of the 65th while under his command. When asked if the Puerto Ricans would fight when the time came, then Colonel William Warner Harris' answer was just as direct: "My Puerto Ricans will fight anyone, anywhere." Many non-Puerto Rican Hispanics served in the 65th Infantry during the war. Among those who distinguished themselves in combat and who served in the conflict as a member of the 65th Infantry was a young first lieutenant of Mexican American descent whose name is Richard Edward Cavazos. 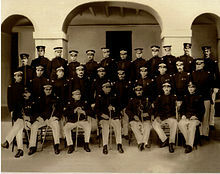 Cavazos entered the military in Texas and served as Company Commander of Company E of the 2d Battalion. Cavazos, who in 1982, became the first Hispanic to become a four-star general in the United States Army,  was the recipient of the Distinguished Service Cross,  the Silver Star Medal,  and the Bronze Star Medal. On 15 February 1959, it was organized to consist of the 1st Battle Group, 65th Infantry, an element of the 92nd Infantry Brigade. On 21 February 1960, commemorated as National Guard Day, the 65th Infantry Regiment was formally transferred from the Regular Army to the PRNG, in an activity where Gen. Cesár Cordero handed the units colors to Col. Rafael Rodríguez. That same year, Company B of the 65th Regiment created Employer's Day (Día del Patrono in Spanish) where the employers of the volunteers that serve in the PRNG are instructed about the job that their employees do with the entity and participate in training of their own. The idea behind the initiative was facilitating the processing of the request of leave-of-absence to train for two weeks during the summer. On 1 May 1964, it was reorganized to consist of the 1st Battalion, 65th Infantry, and remained assigned to the 92nd. It was reorganized again on 1 April 1971, to consist of the 1st Battalion and the separate Company E. This was followed by another reorganization on 1 September 1978, to consist of the 1st and 2nd Battalions within the 92nd, as well as the separate Company E. Less than two years later another reorganization on 29 February 1980, eliminated the separate Company E while retaining the 1st and 2nd Battalions. A Congressional Gold Medal is an award bestowed by the United States Congress and is, along with the Presidential Medal of Freedom, the highest civilian award in the United States. It is awarded to persons "who have performed an achievement that has an impact on American history and culture that is likely to be recognized as a major achievement in the recipient's field long after the achievement." Congressional Gold Medals have also been awarded to: Native American code talkers;  the Japanese American 100th Infantry Battalion and 442nd Infantry Regiment;  the Tuskegee Airmen;  the Montford Point Marines;  the 1st Special Service Force (Devil's Brigade) and the Women Airforce Service Pilots (WASP).